COLOMBO, Dec 23 (OneWorld) - The death of one of Sri Lanka's most venerated Buddhist monks while on a visit to Russia, has sparked allegations that he was murdered by Christian fundamentalists who he had long criticized, and the fear of a Buddhist backlash at his funeral slated for Wednesday. 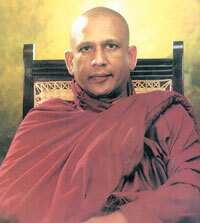 Comment: I am a close friend of Ven.Thero His death is a real mystry. Something like a story from a fiction. Please click here to view a day by day first hand account of how things happened. I am not pointing finger at any one, because I too am now totally confused. Unable to think what hapened. So I think the readers will be better judges. But my point of view is that, the person who invited the Monk to Russia owes some explanation. At least an statement in his web site, telling us, the friends of the dead monk and the family, his side of the story of what really happened and thus release us from this agony. Is it a too much of a thing to ask? Make no mistake that, Buddhists and Hindus in Sri Lanka and India have nothing against true Catholics or Christians and I must say that, the Buddhists and Hindus have much to learn from them. True Hindus and Buddhists are full of appreciation of the good qualities of those truly divine people. Tell me did Hindus ever tried to burn Mother Theresa on a sick ? In one single cry everybody agrees that she is a saint. There are thousands of Catholic and Christian Fathers, Mothers, and Sisters silently doing a great service to the people with extreme dedication kindness and truly Devine compassion. Some people after seeing their good qualities get converted too. If any one want to follow them, please follow their footsteps they are nothing but great, if all these murderers, thugs and thieves could some how be turned in to people like them I am all for it because they are the embodiment of the divinity on earth. We are not against them, if fact it is a bad karma (papa) according to Hindu and Buddhist philosophy even to talk against good people doing a great service to humanity representing the divinity. Therefore, it is hurting for both good Buddhists and Hindus to be accused of that they are against Christian or Catholic Church. What all of us, the true Buddhists, Catholics, Hindus, Christians are facing now is the embodiment of Devil posing as a group of evangelists. Instead of converting through kindness and service as the Catholic and Christian Churches do, those devils cults convert people through cheap tricks of mass miracles, they use money to attract the poor, they are religious extremists and fanatics who preach that instead of seeing a doctor when some one is really sick, they instruct people to keep on praying (recently some children had died with out medical attention) They use hit lists to target the people who go or talk against them and use all sorts of methods of devil such as bribes and threats to achieve power. In short they do not only tarnish the name of the Church, Christ and the God. They also destroy the good work of the dedicated Christian and Catholic priests and the Church. Like a cancer which grows un noticed, first of all they do destroy the Church by distorting the real teachings, converting the misguided Christians and Catholics in to fanatics and diminishing the congregation. Therefore it is not only the Buddhists and Hindus should be worried about it but Catholics and Christians too.